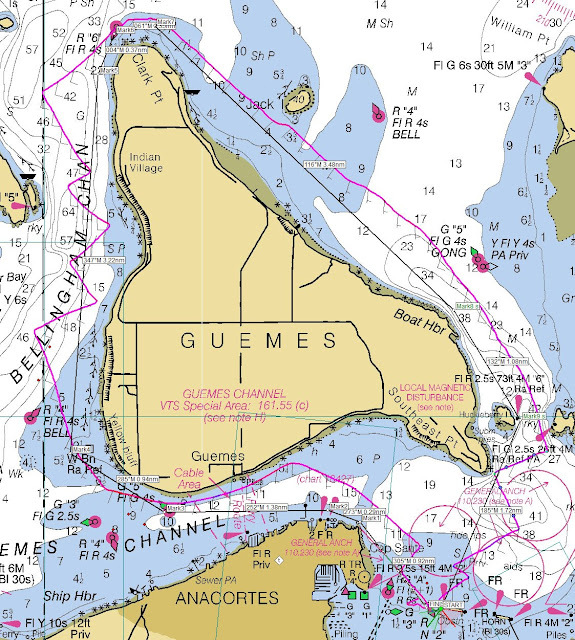 This last Sunday we participated in the annual AYC Round Guemes race - this is a very interesting race as you have to decide which way around Guemes Island you want to go. We were planning to go counter-clockwise, but at the last minute decided to go clockwise as the breeze was predicted to die and go westerly. We also thought most of the boats would go this way and we wanted to cover the fleet. As it turned out most boats went counter clockwise and only a few went out Guemes Channel like us - this as we later found out was the deciding factor in the event! We had a good start and immediately set the A1 and ran to Cap Sante Head. We then switched to the Code 0 (albeit very slowly as it was new to the crew) and rode the building ebb down Guemes Channel. Unfortunately the fleet that went our way were right behind and things were not looking very good. We ran up Bellingham Channel with the A1 against the current in a S-SW breeze of about 7-8 knots - where possible we ran beach in order to stay out of the current. Around the north side of Guemes we dropped the A1 and went to the J1 - partway up the backside of Guemes we launched the Code 0 again and immediately gained some speed. Near Huckleberry we went back to the J1 and beat for the finish with no boats in sight. As we finished we saw the Hobie Tiger (not in the race but running the course anyway) just emerging from Guemes Channel - they had passed us the other way in Bellingham Channel and looked like they were going to clean up. In the end we finished first (the first of the season I might add) by a huge margin. I guess the lesson is that you don't mess with Guemes Channel in a diminishing breeze!